A camera like the just-released a6400 is in the domain of YouTubers and they’ve already had much to say about it. One of them, Ted Forbes just posted his reaction and shared it in a video titled a6400 the Best Vlog ever. I’m not a vlogger, so will take Ted’s word for it. At launches like this, we hang out quite a bit. I make a short cameo in his video at the 9:31 mark and discuss the career opportunities YouTube offers creatives. For $900, the a6400 packs a lot of Sony’s tech into a compact size. It replaces the a6300 and sits just below the a6500 in the lineup. Compared to a full-frame camera, like the a7iii, the a6400 is compact because it’s built around a smaller APS-C sensor. The a6400 is perfect for travel and intended to replace a smartphone with much better photos. 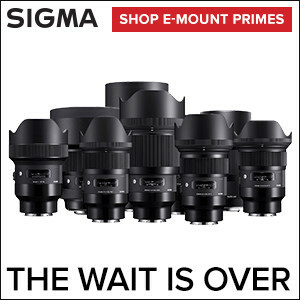 While smaller than the cameras in Sony’s lineup intended for pros, it uses the same E mount so you attach anything from an expensive G Master lens to a budget-friendly Sigma.